Summer holidays are over but the memories can last a lifetime. 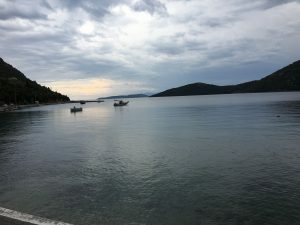 We have just had one of the most relaxing holidays we have ever experienced – in Greece on the island of Lefkada. A comfortable hotel, the San Nicolas, in the sleepy fishing village of Mikros Gailos, overlooking an exquisite view of a peaceful bay surrounded by unspoilt hills and mountains. There were two tavernas where we could sit and watch the fisherman load their nets and return with lobster, bream and red mullet. It got me thinking about holidays past and recent and the ingredients that make them memorable. Inevitably each of us look for different things from travel and David and I are lucky in enjoying similar pastimes, sometimes an adventure and sometimes a simple laze in the sun. This holiday was the latter. We relaxed, walked, swam in incredibly clear waters, and read some excellent books. For those of you who appreciate a holiday reading list I will share with you that between us we read Yuval Harari’s Sapiens, Sam Bourne’s To Kill the President, George Orwell’s The Road to Wigan Pier (more on that to come in another blog! ), Peter Nicholls’ Us, Rose Tremain’s The Gustav Sonata, Kamila Shamsi’s Home Fire, Tolstoy’s The Death of Ivan Ilyich, Patrick Mcgrath’s The Wardrobe Mistress, Irvin D. Yalom’s Staring at the Sun, Robert Harris’ Lustrum, and the start of his new book Munich. What a luxury to be able to lie next to the sea in warm sunlight and have one’s mind stimulated by so many new ideas, scenes, characters and events all happening in one’s head. And nothing, absolutely nothing, in one’s Outlook diary to have to rush to or action. Heaven. This also gave me the time to reflect on memories of holidays as a child, as a parent or travelling alone. Very recently a friend of mine happened to mention that he only ever went on holiday abroad once with his parents. It made me realize that this was the same for me. 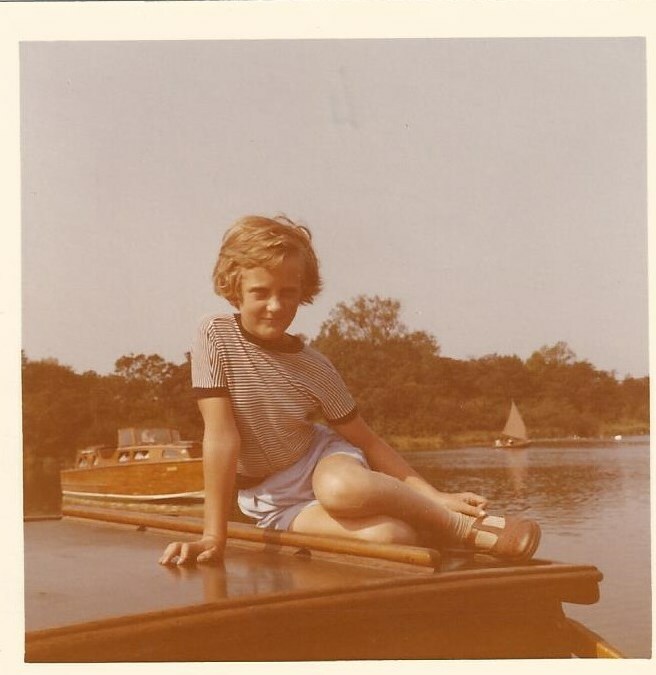 My parents took us on boating holidays on the Norfolk Broads when we were young and then we had one holiday in Brittany as a family when I was about 14. After that they sent us alone to families in France, Spain, Italy to learn the language, broaden our minds and discover how to manage travelling independently. Invaluable. As I heard someone quote once, travel is one thing you buy that actually makes you spiritually richer. Travel was expensive in the 50s and 60s. I think today’s young have accumulated many more air miles by the time they are 20 than I did by the time I was 40. The no-frills airlines have made travel accessible to vast numbers of people so that today people see the world and mix with other cultures as a routine part of life. Previous generations did not have this luxury. I remember that when I worked as a researcher for the late Sir Alistair Horne on The Official Biography of Harold Macmillan, he told me how Harold Macmillan had commented that although the charter flights from Gatwick flew noisily over his house in Sussex, Macmillan was actually delighted whenever he saw one of those yellow Clarkson’s planes as it meant that all kinds of people who could not previously have travelled abroad were now able to do so. Later, as a parent myself, I realized that my parents hadn’t always had as relaxing a time as they might have wished on our family holidays! 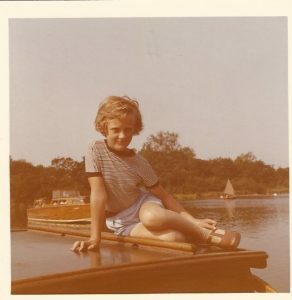 A time on the Norfolk Broads when my father got our boat stuck under Potter Heigham Bridge and never forgave us children for hiding downstairs in embarrassment. Another year, taking us on the River Thames, the engine broke down just as we were heading for a weir – luckily we were saved from a nasty drop by someone throwing us a rope!